Summer fun is soon winding down and the kids will be heading back to school. After a carefree summer schedule, the anxiety over heading to school can bring stress to some kids. Dealing with early mornings, after school activities, homework can be difficult. Here are some tips for a stress-free back to school season. Get back on a schedule. Summertime you likely were more lenient about bedtimes and routines. Start easing into your school night schedule before the night before the first day of school. Kids respond to having a set and consistent routine. Get to bed earlier and share the schedule for the day with them. Keeping a calendar or dry erase board with the day’s schedule can be helpful. Cut back extracurriculars. If your child is overwhelmed with the constant activities, choose a few after school activities to do. You don’t have to do it all. Choose activities that create joy for your child, not extra stress. Get rest. You don’t want your child to be cranky, tired, and exhausted as they head back to school. Make sure they are getting enough sleep at night. If your child is well rested, it will be easier to concentrate in school. Down time is a good idea, scheduling everything to the minute can be exhausting. Have a few days a week where you have the freedom to enjoy activities you love. Your child may want to go on a walk, enjoy a book, play with a special toy, or spend time with friends. Take time to relax. Let your child relax and unwind. Teach them relaxation techniques such as meditation or breathing. Eat healthy. Make sure your child starts the day with a healthy, balanced breakfast. Sugar, caffeine, and food coloring can lead to jitters and should be limited. Pack a healthy lunch and snacks for your child as well. Get organized. Starting off the school year with things in order can help reduce feelings of stress. Clean out your child’s closet and help them try on clothes. Donate those that don’t fit and take note on what needs to be bought for the school year. 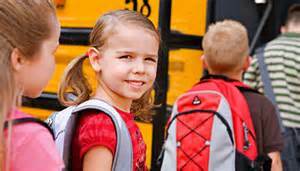 Encourage your child to pack their school bag the night before and lay out everything they need for the day. Mornings spent looking for an article of clothing or homework can be chaotic.